We know that protecting the physical and emotional wellbeing of staff is key to a happy workforce, and to good performance. How can we best protect the wellbeing of ambulance staff, who work so hard under often very difficult circumstances to look after others? And how can we work together to help create a clear career progression path within the ambulance service? These were the issues at the heart of the third #ProjectA tweet chat. Dozens of people - mainly ambulance staff, and also people from other sectors enthusiastic about supporting them - joined the tweet chat to share their ideas. The honesty and openness by participants about what they would like to improve not just for themselves but for their service colleagues too was lovely to see. It's clear lots of good work is already happening, and there is much still to do - there were 78 new ideas suggesting ways to improve wellbeing and career progression in the ambulance services. If you have an idea about improving the wellbeing and career progression opportunities in the ambulance service (or any other issue) please do have your say. Everyone is welcome to join in the conversation - even if you don't have a new idea to add, you can vote on an existing idea, or write a comment on a thread. 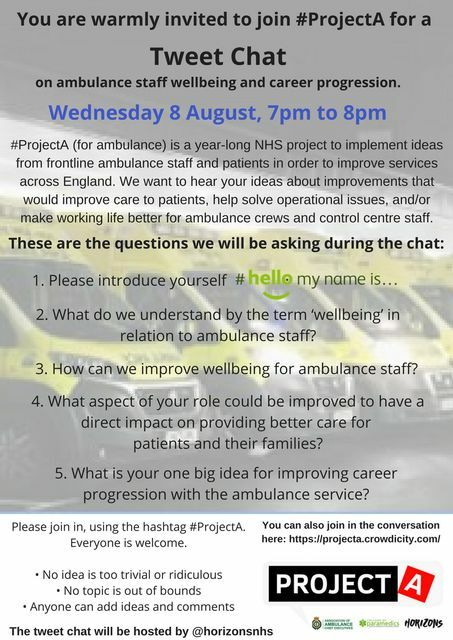 The fourth of the five #ProjectA tweet chats will take place on Wednesday 15 August from 7pm to 8pm, and is about working with partners. Everyone is welcome - we hope to see you there! You can also catch up with the first tweet chat - about partnerships with patients and the public; and the second, which was about patient pathways. Career progression should be available to all ambulance staff - portfolio of careers! Talking openly & supporting colleagues when they present with situations. Our colleagues are delivered sessions on how the role (control room is my remit) can impact on them and how to manage & support each other.